In my book, Womanspirit: Reclaiming the Deep Feminine in Our Human Spirituality (New York: Crossroad Publishing Coo., 1992), I traced four foundations of our faith-dynamics that help us to know ourselves and God, and better serve all those entrusted to our care. NARRATION: We learn in formative spirituality how important it is to trust our story. In the unforgettable words of our co-founder of the Epiphany Association, Fr. Adrian van Kaam, CSSp, PhD (1920 – 2007), “formation is narration.” Life is a series of formative events that move us with God’s grace FROM what was once a comfort zone; THROUGH the pains and joys of a crisis of transition; TO a new path to spiritual maturity, often accompanied by a stronger option to abandon ourselves to the Mystery. CONVERSION: Conversion to Christ is never a once-and-for-all experience. It calls for an ongoing “yes” to what God asks of me since, either intentionally or unintentionally, I can be caught in the nets of inordinate attachments to my own plans and projects, to the pulsing dictates of “control center me.” It takes candor and courage to submit ourselves to this daily turning to grace, to this metanoia and the reformation of my inner and outer life it connotes. It teaches us to transcend fear through love. 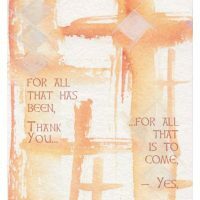 It reminds us that renunciation of egocentricity is the key to liberation of body, mind, and spirit.We feel freed by our trust in God’s call, and can echo the words of Dag Hammarskjold (former Secretary-General to the United Nations) — For all that has been — ‘thank you’… for all that shall be — ‘yes’. MUTUALITY: We are never alone. God is with us. We are in inter-formation with one another through bonds embedded in family life, friendship, and our faith community. This sense of mutuality reminds us, as Jesus taught, that we are our brothers’ and sisters’ keepers. We enjoy equality in dignity. We respect the same unique gifts and talents we have been given and share them for our mutual benefit. When we seek solitude, it is not for the sake of isolation but so that we may have even more reasons to uphold our solidarity on this planet that is our common dwelling place. CHANGE: To trust our story, to practice conversion of heart, to celebrate our oneness in the Lord are modes of being that make it impossible for us to stay the same. We have to change, reforming ways of acting contrary to Gospel values and letting ourselves be transformed into epiphanic manifestations of the Mystery. Rooted in the reality that without God, we can do nothing is the secret that allows us to stretch our wings and fly to places we never imagined ourselves going. The changes we initiate in response to the Divine Initiative often lead to a rediscovery of the treasures of our faith and formation traditions. Study, reflection, prayer, and continual self-examination — all with a view toward service — renders our lives daring, docile to God’s will, and dynamic. To change in this way counters the myth of self-sufficiency and lets us rely on God’s guidance in the swirling seas of this adventure. Formation, reformation, and transformation take time — growth does not occur overnight. We must follow the pace of grace lest, as Fr. Adrian van Kaam cautioned, we lose our peace and our patience. We must learn to both wait and move forward without losing compassion for our own and others’ vulnerability. In these inner, situational, relational, and global expressions of the facets of our faith, we are left with the overwhelming conviction that following God’s guidance radiating from the center of our field of life makes all our struggles worthwhile. A new day is dawning, radiant with strong faith, buoyant hope, and sacrificial love. The spirit of epiphany shines forth in the praise and glory of the Risen Lord. Amen! So glad to be notified of Epiphany’s blog. I thoroughly enjoyed the first post and am looking forward to remaining engaged with our Epiphany community. Interestingly, I was called upon to give my testimony at a recent women’s retreat at my local church. Truly, narration is formation and because of Epiphany, I was able to share in a formative way with others, many of whom identified with my story.